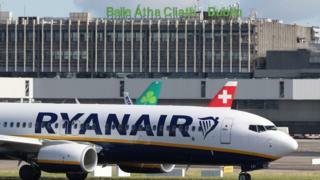 Ryanair says its profits in the April to June quarter have been hit by higher wage costs as the airline faces strikes by staff over pay and conditions. Ryanair is facing more strikes in the next few days. Pilots in Dublin will strike on Tuesday, while cabin crew in Europe will strike later this week. Ryanair also said average fares this summer would be lower than expected. It put this down to tough competition, the heatwave in Northern Europe and uncertainty caused by the strikes. In addition, this coming week will see 300 of its daily 2,400 flights cancelled on Thursday and Friday because of industrial action by cabin crew in Spain, Portugal, Italy and Belgium. Industrial action has dogged the company for some months. In December last year it said it would recognise trade unions - reversing its previous policy - in an attempt to avoid strike action over the Christmas period. "While we continue to actively engage with pilot and cabin crew unions across Europe, we expect further strikes over the peak summer period," said chief executive Michael O'Leary. The pilots' main concern is over "seniority lists", a system used by many airlines to determine a number of things within an airline, including which aircraft type a pilot flies and their schedule. Cabin crew are taking action over a whole host of issues, including pay. Among other things, they are asking for a "fair living wage" and employment contracts written in their own language, based on local, rather than Irish, law. The airline also said it was concerned about the danger of a hard Brexit, warning that the risk of one was being "underestimated". Ryanair said: "While there is a view that a 21-month transition agreement from March 2019 to December 2020 will be implemented (and extended), recent events in the UK political sphere have added to this uncertainty, and we believe that the risk of a hard Brexit is being underestimated. "It is likely that in the event of a hard Brexit our UK shareholders will be treated as non-EU. "We may be forced to restrict the voting rights of all non-EU shareholders in the event of a hard Brexit, to ensure that Ryanair remains majority owned and controlled by EU shareholders."